She hosts the wildly popular Pink Saturday. 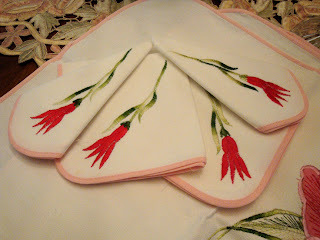 If you want to see more pink, pop on over to her blog to see the entire list. I LOVE this pretty bunny lady. She really should have a name. Hmmmm. 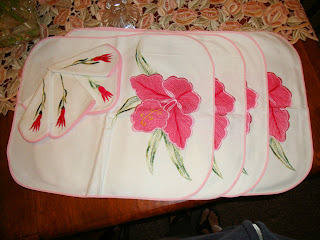 I just acquired this place mat and napkin set at the thrift store. I can only say they seem to be brand new!! What a find!! Pink heaven!! Close up on the napkins...aren't they great? Earl wanted to be the director of the photo shoot. 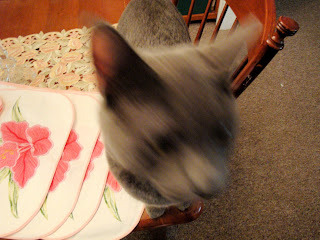 However, he would not pose for a picture...darn. I was born with a problem we shall call brown thumb or over/under water-em. Yes, I....am a plant killer. 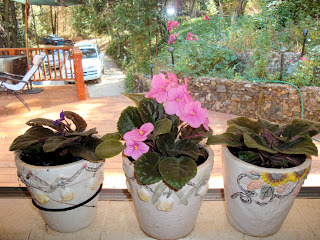 I am in rehab for this and my current project is this set of 3 african violets. I looked up on the internet and am following the directions (pretty much)....and taaa daaa, they are not only alive, but blooming. Yay! The pot on the left has been broken by the above mentioned kitty. I'm sure he's sorry. Ya think? Happy Pink Saturday to you!! Have a very Pink Day!! What is your "Theme Song"
I've been UP and I've been DOWN. I've been "in" and I've been "out". I've been "on top of the world" and I've "been down at the bottom". And, I am always working my way back to the top. Getting up beat and positive takes constant effort....for me anyways. It just doesn't come natural to me. I will tell you for CERTAIN that is pursuit is WELL worth it. Those days when everything is going great??? Well, those days are a gift and I think we should go out and really enjoy it. And, those days where one thing after another seems to be threatening my happy mood.....those days call for a THEME SONG! Have you ever noticed how music can uplift your spirits? Have you ever noticed that you can hear a certain song and be transported to a different time and place...or be reminded of someone or something. For Me, if I am not as happy as I want to be....music goes a long way toward solving that! Have you ever heard that your "inner world" creates your "outer world"? So you really are....what you think about. Can I brainwash myself in to being happy and positive? Well I am on that track!! My current "theme song" is Viva La Vida by Coldplay. I love the tune and the beat! And, MY interpretation of the words is that .....I have ruled the world, and I have had it all go away. This song reminds me that I am the ruler of MY world , RIGHT NOW!! If you want to hear it...scroll down on the right and press play. So, find your Theme Song, turn it up and Dance Like Nobody's Watching. Tell me what your theme song is.....and why....I really want to know!! There is a narrator in my head. You know, a voice (that is really me) and this voice is describing everything I'm doing. I think it's getting even stronger since I started blogging. I can hear myself sort of writing a blog in my head about whatever I'm involved in at any given moment. Now, very VERY few of these imaginary blogs ever actually make it in to reality. It's funny to me. I love reading blogs by those very talented writers who can make anything sound interesting or funny. Most of the time, I just sit here at my blank screen wondering....what do I have to say? Think. Think. Think. Yep. Nothing. But, hop in the car and go somewhere and do something...and then the narrator starts right back up, creating wonderful words to convey an entertaining, witty story to tell....only to be forgotten as soon as I sit down to the computer. This is a sweatshirt that I re-made into a jacket. I cut off the sleeves and the bottom and I put on some fleece from a blanket, oh, I also added some darts in the front and back. I was going to put in a zipper, but I couldn't work that out, so I chose to put some ribbon ties on it instead. I think it's going to be nice and cozy when it gets a little cooler. Watch for more of these sweatshirt re-dos...I bought a bunch of sweatshirts as soon as they started showing up in the stores. Of course, it's the same situation as the paragraph above. When I can't find any sweatshirts in any store...anywhere...well, then I have tons of fun ideas for remaking them. Now, that I have a bunch of them...I'm drawing a blank! Last week, it started getting cool, so I wore my jeans for the first time since summer. Oops. I was so hot! 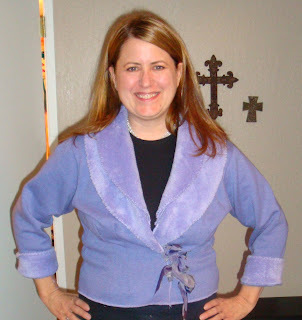 One of my rituals is to switch out my clothes every fall (Labor Day) and every spring (Easter). This is not something that most of my friends do here in California. I actually pack away my clothes each season, so it's fun to get them out. I haven't done that yet, because it has still been pretty warm. Well....that seems to be changing quickly now. We had our first fire in the fireplace. We rely on wood heat pretty much. It's cozy and warm and constant. When it starts getting cold, we will just keep the fire going, nonstop. 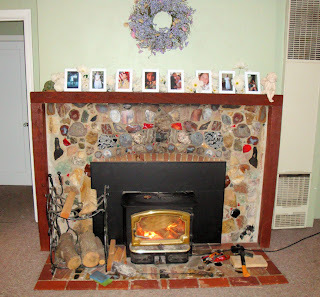 When hubby built the fire, we were both commenting on the smell...just love that! I can do it...but I'm not that great at starting a fire...hubby says I use too much paper (he doesn't use ANY paper!). I was walking outside yesterday and the wind came through the trees. We have lot's of pine trees, really tall ones and lots of oaks. When the wind comes through it makes a roar. Wish I could tape it for you, it's one of those sounds that is INCREDIBLE. One time some friends were visiting from the city and the husband said he could hear the "rain". It wasn't raining...he had never heard the trees "roar" before. OOoo I can hear it right now. Nice. They are a-fallin again. They do it every year! And, every year we strive to get them off the driveway before it rains and makes them all messy. Where's my rake? Cozy fires, warm sweaters, hot tea, trees "raining" leaves....and I guess I better start figuring out what I'm getting everyone for Christmas! I'm SO not good at gift giving. 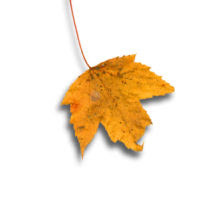 What does fall make YOU think of? And, I'm so excited! This is the first event that I have attended in "blogland". I am seeing PINK everywhere. Have you ever noticed that? When you are thinking about something, it shows up all over the place? I just happened to change my blog to pink a few days ago. And, I see that I am wearing pink in my current photo. Geez, I think I will fit in with folks who like pink!! 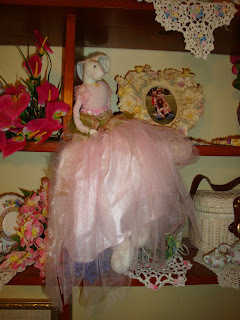 I am looking forward to visiting all of the Pink Saturday blogs over the next few days. What a blast! This is my favorite pink thing. 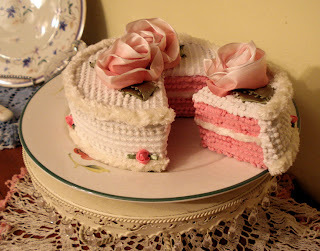 I love chenille and I LOVE birthday cake with REAL frosting! Doesn't this look good enough to eat? 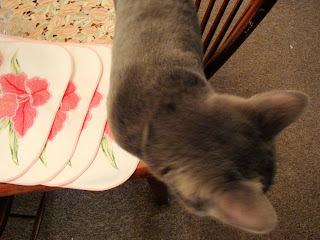 Interestingly, Pookie thought so too and he ATE the little piece of cake that you see in the photo. I was (and still am) so sad about that! I have since found a very pretty, glass covered cake plate to protect what's left. 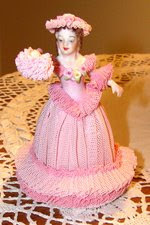 To console myself, I found the lady who made it on Ebay and bought a chocolate cake. Is there a Chocolate Day? This is my best friend, Connie and me. We didn't plan this....it just happened that we both wore Pink. 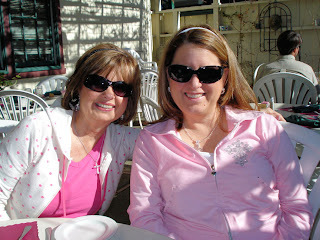 Well, admittedly it happens a lot...because I love pink and Connie...well she LOVE'S pink. Note to Connie: I'm looking forward to our fun trip on Friday!! Can't wait!! Miss you! 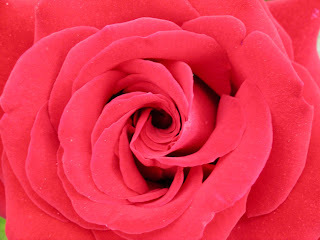 This beautiful rose is one of my husband's photographs. He is so talented. And, I'm so lucky!! Is there a pink "state of mind"? If there is I imagine that it is fun, lighthearted, bright, loving and feminine. Care to add to that? At our local beading store, The Hole Affair, they have a challenge every so often. I'm pretty new to beading, so I couldn't imagine entering. Well, I did imagine....only nothing came to mind. 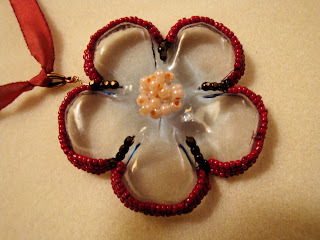 That is the hardest part of jewelry making for me....coming up with some idea of what to make. The challenge was to make something "recycled". I pondered this and after some time, I had a crazy thought. What if I made jewelry out of garbage?? Well, I checked out my garbage, and eeewww. I thought about a tin can, couldn't imagine that. Then I decided it would be a water bottle, because I have lot's of those! So, I looked at the bottle for a while and ....still nothing. Then I decided to cut off the bottom and use it. GREAT IDEA...now, I'm on to something! I "saw" a flower there in the bottom of the water bottle. I, personally, only drink Desani in emergency situations. 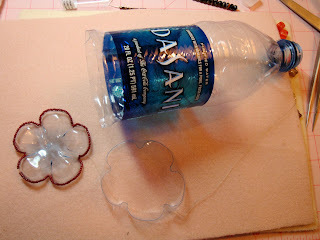 I prefer to drink my water "straight", and Desani has salt added in. Who needs that? But, the bottom of their bottle was the best one for my flower. So, I cut it out. And here is the result. I love it! And....I might actually even wear it. 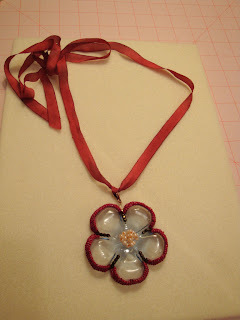 I have already turned it in to the contest and I'm bummed because I added a couple of really pretty bronze beads on the ribbon on both sides of the knot. Please use your imagination here. I actually "sewed" these beads on. Absolutely no glue! I broke several needles and my fingers were really hurting until I figured out a way to use my pliers. And, the plastic is really thick in the center, so I used a hammer and a nail there. I felt kind of crazy at the time, and I even wondered if I would ever even tell anyone about it. It turned out okay...so I can go public after all! Now, if the sweater I am trying to knit turns out, THAT will be a miracle. I will go to class tomorrow and see if my teacher can save it. Maybe, after that, I will show it. I love reading blogs. It's so fun to take a peak in to someone's life. I enjoy finding people that I have so much in common with. The problem is MY blog. 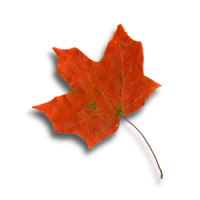 I can't seem to find "myself" in blogland. I tried putting on a new background, that was waaaaayy cool, and here I am only a day or 2 later, changing it again, back to my pretty flowers. It's funny. It's just a blog. But, it has made me think about myself. Who am I? What do I want to portray? What do I want to attract in to my life? So far, I think: Happy, bright, fun....with interests that include: All Things Cottage, Tea, WHITE, definitely flowers!, and hobbies: sewing, beading, knitting, crochet and decorating...and maybe photography. And, of course...family. I'm sure the answers will come....for now, it's tea time! 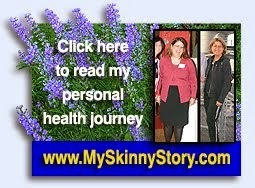 I have a website that I named "My Skinny Story". What started out as a personal (VERY personal) journey...ended up being something that I felt compelled to share with others. The number 1 reason I felt "led" to share my weight loss story, is the fact that I have never forgotten how I felt, how I suffered and what it cost me. I searched for solutions, tried so many things, that I think I was in a place of "lost hope". I wasn't even praying for a solution....I was too far gone for that. Maybe you think that the words I am using are too serious. And, I suppose that they may be. But, that is how I felt. My sadness wasn't all about my weight or how I looked, I would have thought that it was, but I know in retrospect that my sadness was an accumulation of so many things. Old tapes playing in my head from people and times past. Probably age catching up to me. Like so many things in life, the solution...found me. Isn't it funny how it happens that way sometimes? I have a new button on the right hand side of my blog, if you want to read the "whole" story, click on it. Lest you think that losing weight made my life perfect, allow me to relieve you of that erroneous thought. My kids still cause drama in my life. I still have insecurities. I still have plans to better myself. And, I still have to work at keeping that weight from coming back. It's just easier now. Maybe there is someone out there in blogger land that is looking for me and my story, the same way that I was once looking....well...I'm here. These are my "Amulet Bags" that I learned how to make at the Bead Store (The Hole Affair). I am completely in love with making these. 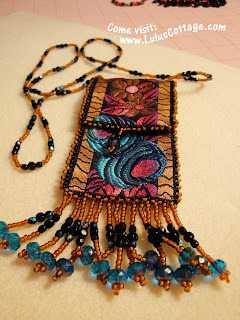 They are made with ribbon and beading. The ribbon is folded and sewn together and beaded all around. My favorite part is the fringe. 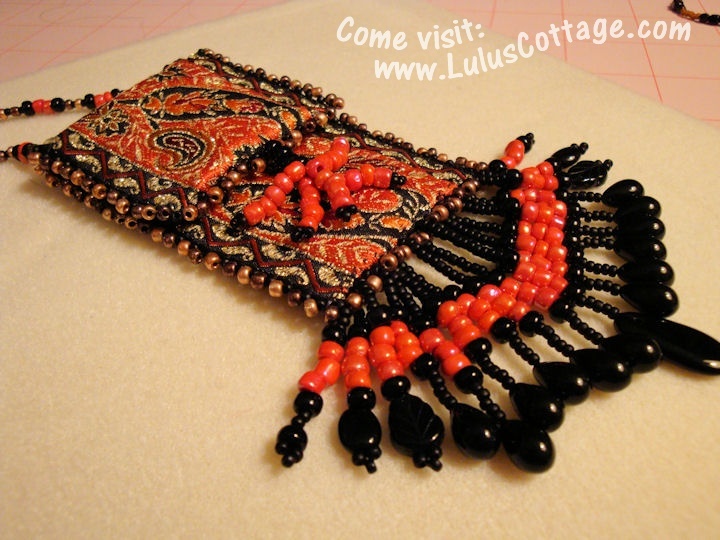 I went crazy and bought more ribbon, so I will be making more of these for sure! 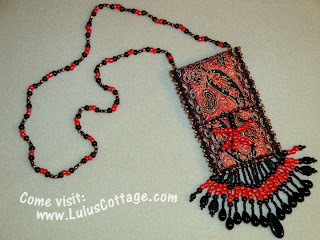 It's fun to choose the bead colors (harder than I thought) and make the patters. 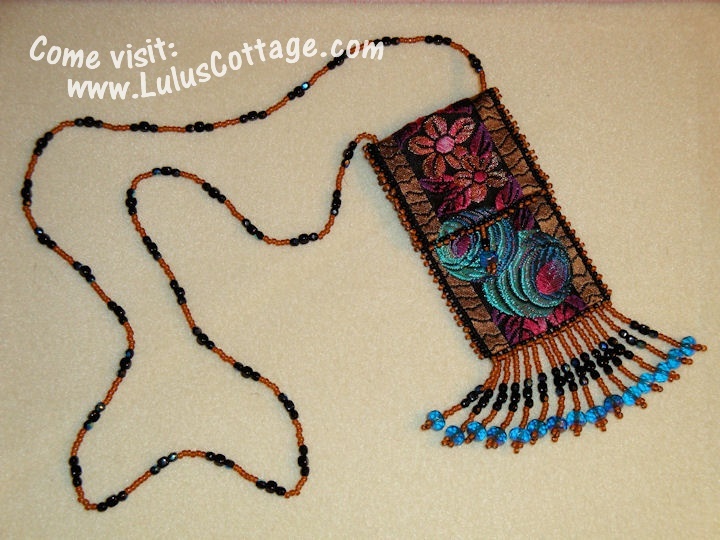 It's a great way to use up my "stash" beads! Wow. I stumbled on to For the Love of Cottage blog (which I adore!) and she had a link to the creator of her fabulous background, Aqua Poppy Designs and I have been wandering through her many creative backgrounds. I simply could not choose, there were so many! Here is my choice for now, it's called "summertime". I want to try them ALL!! It was easy, SO easy to do, and her instructions were written with all the details. If you use one of her backgrounds, let me know, so I can take a look! Okay. I have played on the computer TOO long! I have a new goal to exercise every day, this is day 2, lol. Why do I avoid it? I want to be in that place where I WANT to exercise. I have the equipment that I like, and a space that I enjoy being in, I have lots of loud music to inspire me. Now, I just need the will power and stick-tu-it-tive-ness! 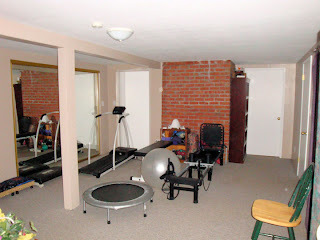 This is my downstairs room, we will call it the "workout room". 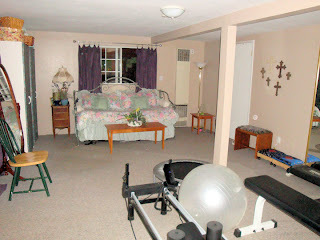 Last weekend we purchased a new (to us) exercise bike at a yard sale. I didn't think it would fit and after moving things around, it seems like there is actually more room than before. 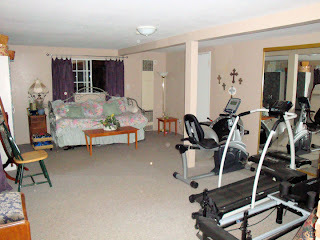 So, enjoy the photos and imagine me HAPPILY exercising to my favorite tunes! See what I mean? It looks (and feels) bigger. See that door on the right? That's my sewing room/closet. I'll show that space on a future post. It was pretty chilly this morning. I could really feel that cold weather coming! I used to wake up to a cup of coffee in the morning. There is just something special about that hot cup of comfort! I also used to NEED that coffee in the morning to wake up! And, I also used to have trouble sleeping and a severe lack of energy. Is there a connection? I think so. Anyway, I don't drink coffee any more and today, I decided to make a cup of tea. Mmmmmmmm. My friend, Connie, said that I must drink this coffee from one of my "pretty" cups. And, she was right, it does taste better that way! 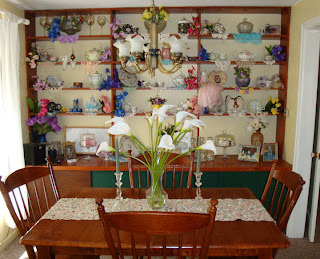 This is my dining room and all of my tea stuff. 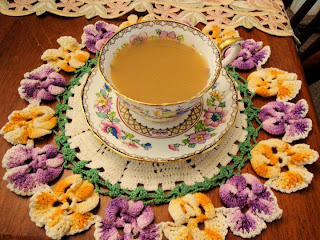 I love teacups, teapots and doilies (as you can see). I'm going to enjoy this view for a little while longer....and then it will all change to holidays! Won't that be fun? Are you looking forward to the holidays or dreading them? I'm always mixed. Last year, I tried to skip the holidays entirely. But, my husband made me get out all of my decorations, and after I pulled everything out, I really got in to it. It was a complete surprise to me that he even noticed something like that. The cool thing about his talking me into decorating, is that it obligated him to help! Maybe I will "pretend" balk at getting out the holiday decorations this year!! Our youngest, Jesse, got out of the Navy in June. His dream job has always been to live and work in Yosemite. It's taken this long, but they have offered him a job and he starts on Monday!! Yay!! We'll miss him, but this is so great! We love going to Yosemite so much. It's about 3 hours from here. I'm hoping he forgets something important so we have to drive over there right away! These photos are not my photos. My husband is a true artist at photography. 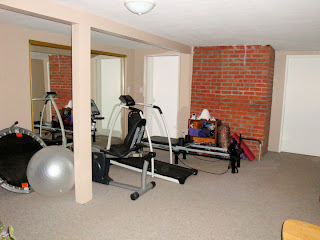 I had to share a few of my favorites and all of the photos in this blog entry are his. Yosemite is a National Park in central California. It's a truly magical place. I love it so much that I think it's "MY" Yosemite!! My parents took our family for vacation to Yosemite when I was a little girl (in the 1960's). It was quite a different place back then, and I am grateful for the memories. We had never been camping before. The first time we went, my Dad rented an RV. The next time we roughed it with a Tent Trailer. Then down to a tent and finally sleeping under the stars. In the 60's, the bears were a part of the experience. They came out at dusk and wandered around. People were not afraid of them really. Just excited and taking photos like crazy. I remember my folks arguing one time about the foot locker that our food was in. My mom wanted my dad to buy a lock. My dad said that bears were dumb and couldn't open a foot locker. Daddy put a stick through the lock, informing us girls that bears don't have thumbs and fingers, and could not open the locker. Later that night, a bear came to our camp and we shivered with fear in our tent as the bear rummaged through all of our stuff. People walked by in their jammies, toothbrushes in hand...."Ooooh, look at the bear"! Then the bear picked up the footlocker, shook it and set it down. He calmly pulled out the stick, opened the chest and feasted away. Mother gave Daddy "that look". My sister and I were both mostly concerned with our precious breakfast cereal. She liked Captain Crunch and I had Lucky Charms. We were "willing" the bear to eat each others cereal!! He munched on both, and he rejected BOTH! Luckily, our parents decided to buy more food at the Yosemite store and we were able to finish our vacation. Now-a-days, the park enforces a strict policy of putting all food in steel "bear boxes". If you don't, you will get a ticket! Yosemite is huge. You can hike for days. And, there are many soaring mountains and cliffs, so it is a popular place for rock climbing. Our favorite thing, well MY favorite thing for sure, is rafting. You can only do it in late spring, and it is so wonderful. It's a peaceful slow trip down the river and the views are the best! This is how I "roll", down the river. 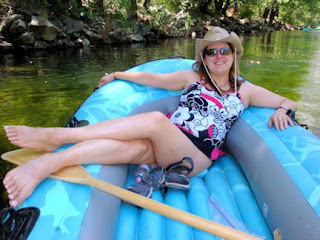 Hubby is great at paddling, and I am great at relaxing!! My husband went to Yosemite as a kid in the 1960's also. We have that in common. Who knows, we may have even been there at the same time! I had a strong memory of an event that was so stunning, I wondered if I imagined it. But, it was real! It was called the "Firefall". 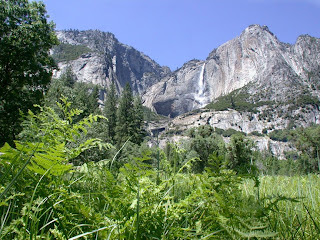 Yosemite is famous for the waterfalls, and years ago, they had an event, nightly, call the Firefall. They would build a gigantic fire at Inspiration Point and then they would push the glowing embers off the side of the steep (straight down!) mountain. From the Valley floor, it was a unbelievable sight. I can't even describe the excitement and anticipation to you. And, it was always a complete delight. When our kids were little, we went to Yosemite many times. We camped in a campground outside of the park. We really roughed it, and we were proud of our toughness! Sometimes when we were in the valley, sightseeing, we would to to "Housekeeping Camp" and pay 25cents for a shower. There were tent cabins and "real" bathrooms. We would snicker and say to each other "that's not camping!". We have been having a family trip to Yosemite for the past 7 years as our children are all grown now, it's more like a family reunion. We all look forward to it all year! 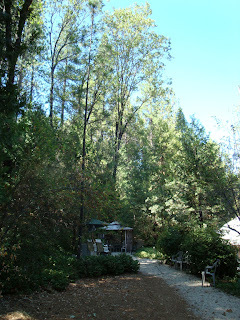 And, now, when we go to Yosemite, we stay at Housekeeping Camp, with tent cabins, electricity, bathrooms and showers! And, we LOVE IT! 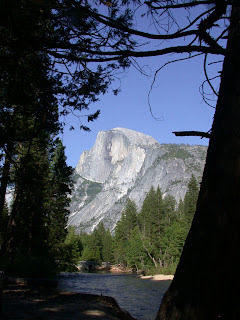 Our oldest son worked at Yosemite 10 years ago. He even met his lovely wife there. They have many fond memories of Yosemite. In fact, they even named their daughters in honor of their time there. Aurora, the oldest, because "Aurora" means "dawn" and that is when they first met. 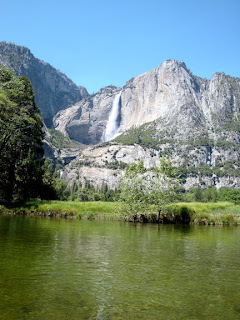 Tenaya, the youngest, is for Lake Tenaya of Yosemite. Isn't that sweet! They have grown up going to the park at least once a year. 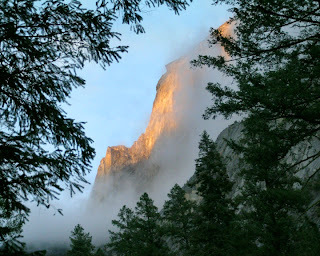 One of my favorite photos of Half Dome in the mist! Here is my photographer hubby! This is the view from Inspiration Point. It's like standing on the top of the world! Where are my keys? I need to get in the car and drive over there right now!